Mrs. Hoden's Blog - Please tell me about your family. 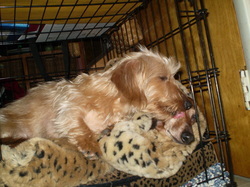 I have two miniatures dachshunds. 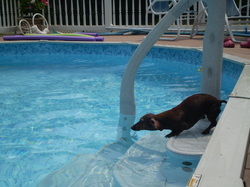 Tootsie Roll is 9 years old and loves to dive into the pool. 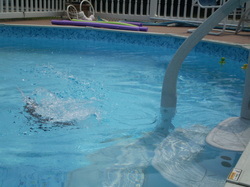 Tootsie is in mid-air diving into the pool. Yep, you are correct. 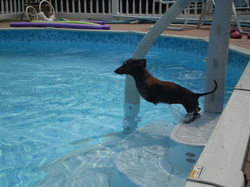 Tootsie is under water! Tinker Bell is 2 years old. She loves to kiss Tootsie. 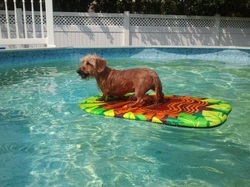 Tinker Bell loves to surf in our pool when she gets hot during the summer months. I have had the privilege of teaching in Little Egg Harbor School District for 25 years. I have been the teacher for the Gifted and Talented students, 6th grade students, 5th grade students, Science Lab Teacher and currently the Technology Literacy Teacher. My philosophy for teaching through-out my teaching career is: Learn something new each and everyday of your life and share it with others. I hope you have enjoyed looking at my website. Please share something about yourself by making a comment in the blog. Now, you have a great learning day!